Myofascial Cupping Therapy is a very versatile technique that can be used to decrease pain, treat Trigger Points ("knots"), reduce fascial restrictions, and improve range of motion. It uses negative pressure to "lift and seperate" soft tissue, creating a passive stretch. 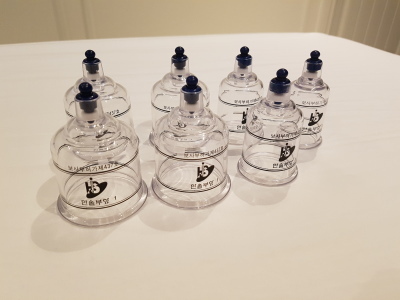 This style of cupping is different from Traditional Chinese Medicine. Marking the skin is not a desired outcome of this treatment and it is performed at a pressure level that provides minimal discomfort to the client. It is easily incorporated into a traditional massage and is beneficial to most clients.